Jonson Clarke-Harris says he is happy to continue in his role as a lone striker for League One side Oldham in the final weeks of the season. The 19-year-old scored twice and set up the other goal for James Wesolowski in Saturday's 3-2 win at Bradford. "It's a hard job but I know I'm fit enough to do it. I love playing up front. I'm just happy to be playing," he told BBC Radio Manchester. 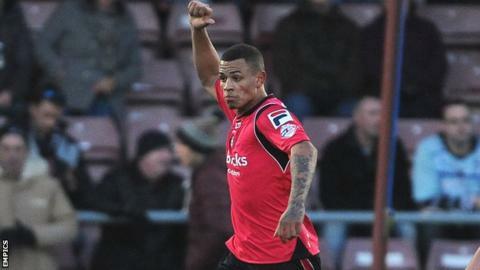 Clarke-Harris has scored eight goals in 44 outings this term. And the former Coventry and Peterborough frontman revealed a pre-match talk with manager Lee Johnson inspired him to more goals against the Bantams, having netted in the reverse fixture back in December. "I knew that [the opposition were scared to face Clarke-Harris] before the game - the gaffer and the staff told me," he said. "But I couldn't really let that get in my head. I just had to play the game I play. "He [Johnson] asked if I was going to be a whirlwind or a whirlpool. I told him I was going to be a tornado." Oldham lie four points above the relegation zone but that gap could close at the weekend as they are not in action again until a trip to Colchester on 18 April. The Latics were due to host Sheffield United on Saturday, but that game has been put back to 29 April as the Blades are in FA Cup semi-final action against Hull. Johnson told BBC Late Kick Off North West: "We have to stay focused because there are five important games coming up. "That win [on Saturday] was very important because we didn't want to be touching the relegation zone come the next time we play, which is on Good Friday [at Colchester]. "We're probably going to need four points to make sure of survival. I'm confident we can do that."